I recall the day I graduated high school in 1997 - I could not imagine my 10 year high school reunion. It seemed so far away and while that day came and went, it truly showed me how fast 10 years goes by. Crap, my 20 is less than 4 years away!!!!! Well over ten years ago, my Dad was on the board of directors for Little League, a baseball and softball coach and the Cub Scout Master. He made it a life priority to give back to the community we grew up in. Dad was such a positive influence to our local youth. To this day, so many of those kids who are now approaching or well in their 30's, still refer to him as Coach Wood or Coach. To me, he will always be Daddy, rocking the Ray Ban Wayfarers welllllll before they were cool to us. Ten years ago today, my Daddy left this world. October 14th 2003 was the hardest day of my life. 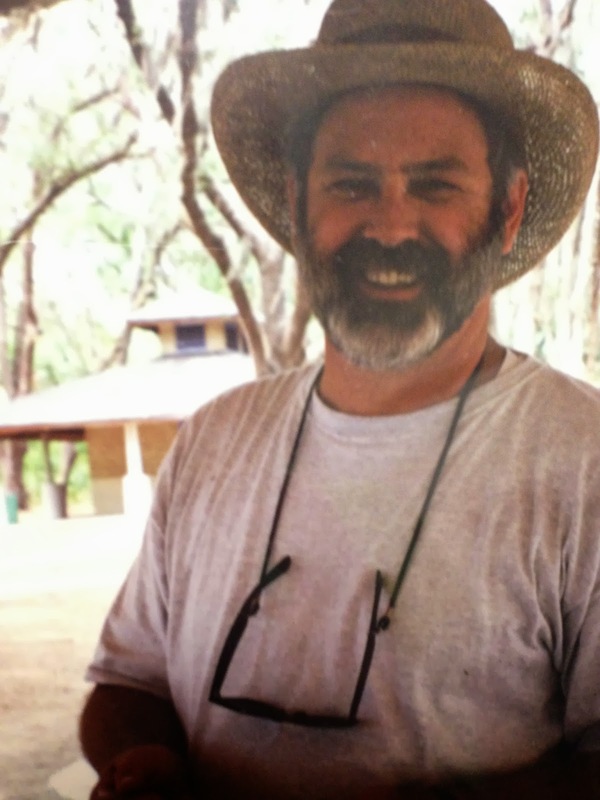 On 10.12.03, eight days after Dad had a cerebral hemorrhage, he slipped into a non-responsive coma. This lasted 48 hours and seeing my Daddy as a vegetable was beyond anything I could put into words. On 10.14.03 I woke up at 4am knowing something wasn't right. Before the Doctors called, I had already informed my Mom that Dad had left the world as we knew it. She nearly admitted me into the crazy ward until the Doctors made the call. Paranormal or not, I woke up in the wee hours of the morning knowing for sure that I would never seeing my father again. While it is very hard for me to grasp that it has been 10 years since I have spoken to, seen or be held by my father, I still miss him every day and it breaks my heart he is not here for my upcoming wedding. I knew I had to honor this day to Brian Wood. I mean, I celebrate national guacamole day so I am making up my own fake holiday today - National London Broil Day. This blog wouldn't be alive if it weren't for Daddy. He gave me the competitive drive to achieve goals which I couldn't imagine (NYC Marathon). He taught me to cook. Daddy was my go to foodnetwork.com before it existed (Dad.....how do I know when a steak is Medium Rare? Dad, how do I make my mashed potatoes non-lumpy? Dad, I have a fire in my kitchen!?). Cooking was my way to connect to my father. So today, I am bringing you something I don't make nearly enough. It is the very first thing I ever learned to make and is my ultimate comfort meal. I made this dish the night I moved out of the parents cave, while calling Dad 10x a night asking questions on what to do next. I giggle now as this is a simple recipe, which I could never complete without the help of my Daddy. If he were still here today, I would find an excuse to call him for London Broil execution. In a heated cast iron skillet, sear your meat for 2 minutes each side. If 1", place into an oven for 3 minutes for Medium Rare. Add more time for additional thickness. Let rest for 5 minutes and cut against the grain. Boil a large pot of salted water. bringing to a boil - meanwhile, peel your potatoes and cut them into cubes. Place potatoes into water and bring back to a boil then lower to a simmer for 15 minutes until you can stick a fork in them and they fall apart. Heat milk and butter in a saucepan (don't let it come to a boil). Set aside. When the potatoes are done, drain and mash them using a potato masher (I usually vision exes or bad co-workers). Once they are to a mashed consistency, stir in the hot milk mixture with a rubber spatula. Slowly add the buttermilk to make your mashed potatoes to the creamy consistancy you are looking for. Season to taste. Normally, I would serve this dish with an amazing red wine. I chose to serve this with a bottle of bubbles to honor my Daddy. 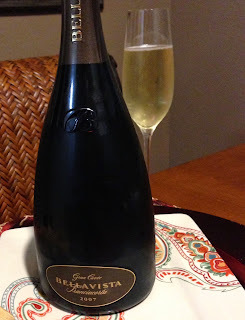 I fell in love with a bottle of bubbles, Franciacorta Cuvée Brut Casa Bellavista. The grapes are 80% Chardonnay, and 20% Pinot Bianco and Pinot Nero - perfection to any bubble lover. 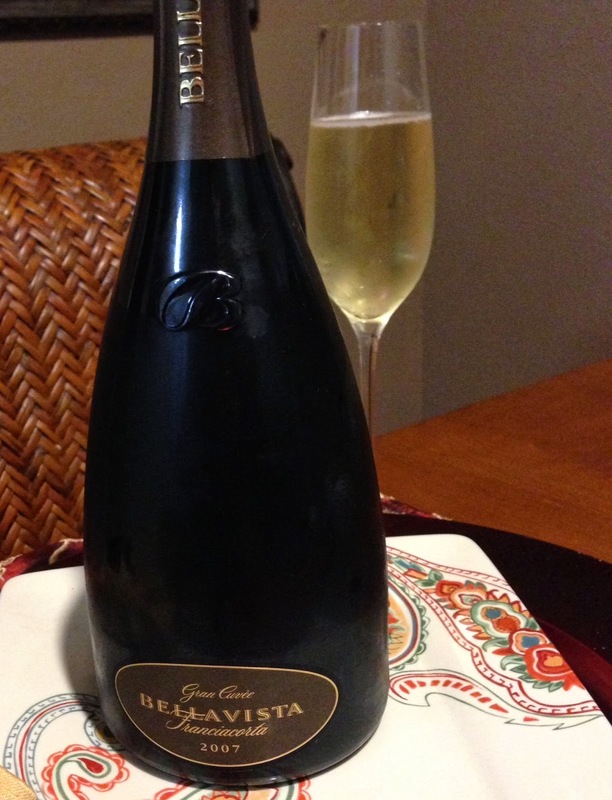 I would normally pair this amazing bottle of bubbles with a nice seafood dinner but wanted to honor my Dad in a fancy way that would embarrass him if he was around!! This bottle was equivalent to those one spends $150+ a bottle on and I know exactly what I will be stocking up for the last week of November after 3 huge races are completed. This is such an amazing post Megan. I'm sure it would've made your Dad very proud. Loved reading the wayfarers reference and that everyone still calls him "Coach" today. He sounds like a really, really cool guy. Will have to make this recipe soon...looks and sounds so yummy. I loved this post I found you looking for a london broil recipe and this post was just full of so much more.